Board-n-batten siding accents a box bay set off by stone. A metal roof tops another bay window, while dormers, arches and columns create a dramatic entrance. 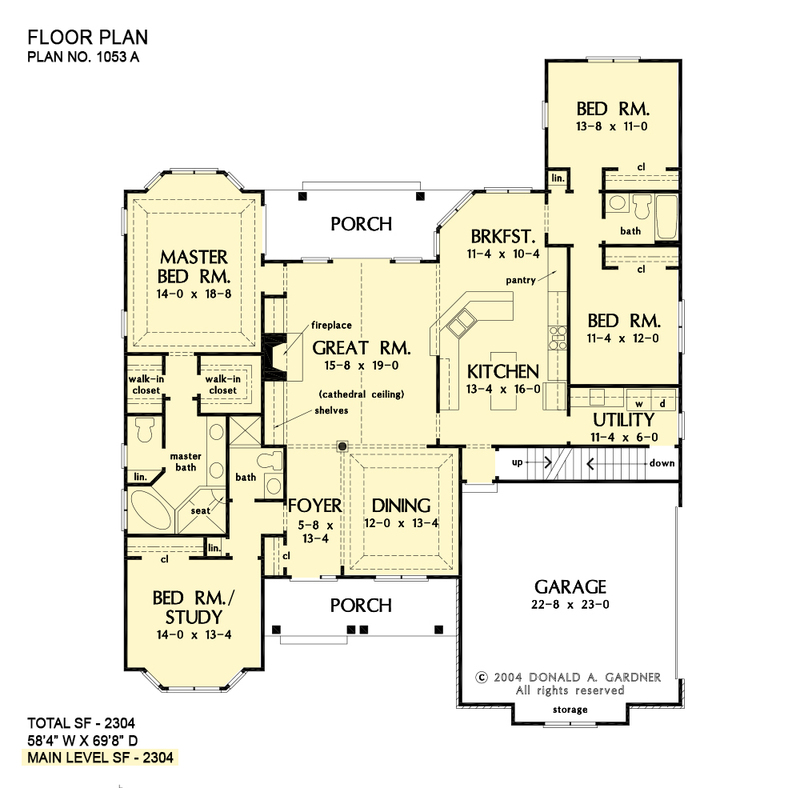 The family-efficient floorplan features a natural traffic flow, making everyday living easier. The column and tray ceiling of the dining room opens to the grand cathedral ceiling of the great room. An angled counter is all that separates the kitchen from the breakfast nook. Flexibility abounds in a study/bedroom and bonus room, while the master suite provides a private haven. As a bay window, tray ceiling and French doors highlight the master bedroom, the master bath is complete with a private privy, double vanity, separate shower and garden tub. 1st Floor: 2304 Sq. Ft. 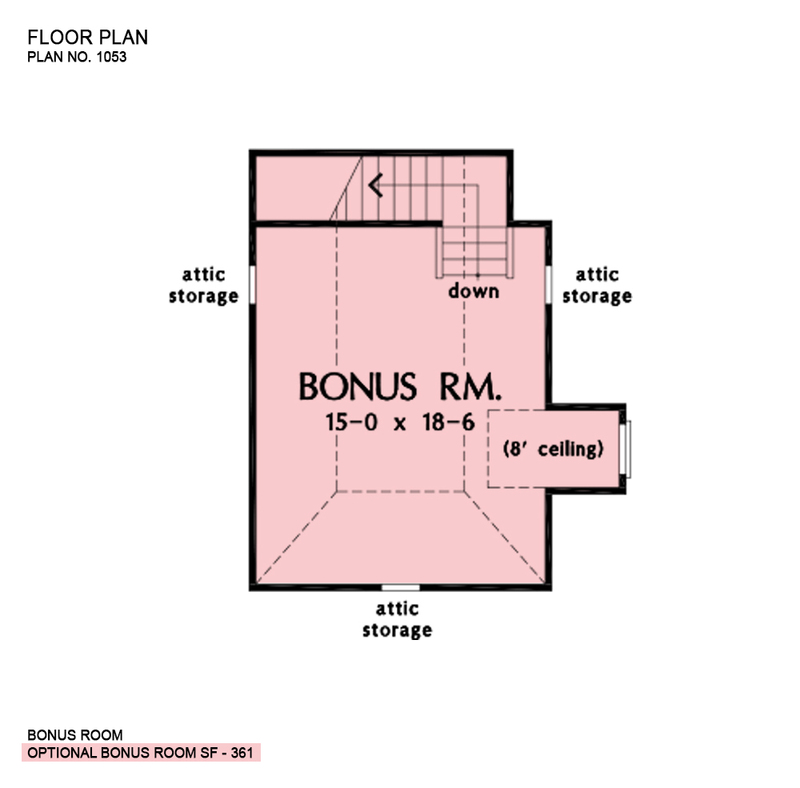 Bonus Room: 361 Sq. Ft.
House Dimensions: 58' 4" x 69' 8"
Great Room: 15' 8" x 19' 0"
Master Bedroom: 14' 0" x 18' 8"
Porch - Front : 20' 4" x 6' 0" x 9' 7"
Utility Room : 11' 4" x 6' 0" x 9' 0"
Bedroom #3 : 11' 4" x 12' 0" x 9' 0"
Bedroom #4 : 13' 8" x 11' 0" x 9' 0"
Bedroom / Study : 14' 0" x 13' 4" x 9' 0"
Bonus Room : 15' 0" x 18' 6" x 9' 0"
Breakfast Room : 11' 0" x 10' 4" x 9' 0"
Dining Room (Tray): 12' 0" x 13' 4" x 10' 6"
Foyer : 5' 8" x 13' 4" x 9' 0"
Garage Storage : 11' 4" x 3' 4" x 0' 0"
Great Room (Cathedral): 15' 8" x 19' 0" x 16' 6"
Kitchen : 13' 4" x 16' 0" x 9' 0"
Master Bedroom (Tray): 14' 0" x 18' 8" x 10' 6"
Porch - Rear : 18' 0" x 7' 4" x 9' 0"